Tandil, an Altmer sorcerer, is a member of the Psijic Order who arrives at the College of Winterhold along with Quaranir and Gelebros to secure The Eye of Magnus. 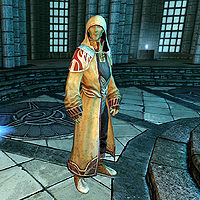 He wears a full set of Psiijic robes, which includes the hood, a pair of boots, and a pair of gloves. Should you approach him, Tandil will only say, "It is time for us to go." This page was last modified on 2 July 2013, at 01:17.